If you are missing several consecutive teeth, you may be a good candidate for a dental bridge. Made of several artificial teeth, this porcelain prosthetic can literally bridge gaps in your smile. Drs. Bryan Shanahan and Ryan Tuinstra offer bridges as a restorative treatment at their Flagstaff, AZ, clinic. With more than 25 years of experience, you can rest assured you are receiving the best dental care possible. 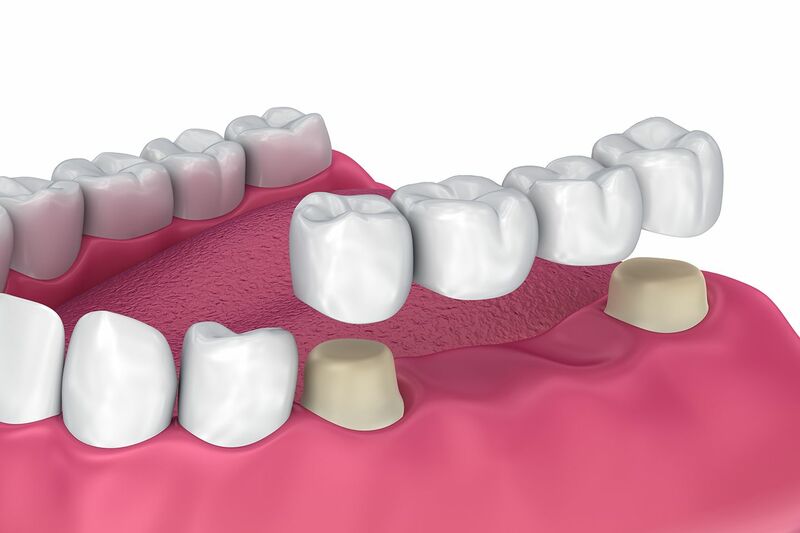 Like a dental crown, a bridge is placed directly on top of your existing teeth. Restoration of oral function: Missing teeth can impede your ability to chew. People who are missing their teeth people often chew on the healthier sides of their mouth, causing excess wear on remaining natural teeth. Dental bridges prevent this by restoring normal chewing function and bite balance. Resolving speech difficulties: When you lose teeth, it can make pronouncing certain words much more difficult. Consequently, replacing those teeth can making speaking more comfortable and less awkward. Restored smile: Because of the jawbone recession that often follows after we lose teeth, missing teeth often leave us looking older than we actually are. Replacing those teeth can rejuvenate your entire appearance. Boosted self-confidence: A missing tooth is more than an inconvenience: it can also be an embarrassment. Correcting problems with your smile can lead to better confidence when speaking in public or socializing in general. Most patients who are missing one or more adjacent teeth are eligible for a dental bridge. However, the teeth neighboring the gaps in your smile must be strong enough to support the dental crowns that anchor traditional bridges. Furthermore, patients should not have advanced gum disease or other oral health conditions that could compromise the success of their restoration. If you are interested in an implant-supported bridge, you will need to have enough jawbone to support an implant. If you lack this tissue, a bone craft can potentially boost your candidacy. Your procedure will vary depending on whether you choose a traditional dental bridge or implant-supported bridge. In order to accommodate the crowns that anchor your bridge, a small amount of enamel must be removed from the teeth that sit next to the gap in your smile. One of our doctors will use a local anesthetic to numb the area around your tooth before it is partially shaved down. An impression will then be made of the resized teeth, which will serve as the basis of your customized bridge. To protect your teeth, we may place a temporary bridge while your permanent restoration is fabricated. Once the permanent bridge is ready, we can test the fit and attach it to the teeth with a strong bonding material. If you are missing one or more tooth, you’re not alone. An estimated 178 million Americans are missing one or more teeth. Rather than crowns, this type of bridge is supported by dental implants. After taking an impression of your smile, we may first schedule a bone grafting procedure to boost your candidacy. If it is successful or if the surgery is not necessary, we can set up your placement procedure. During this surgery, the doctor will create a small incision in your gums and jawbone and place the dental implant directly into the bone tissue. Your jaw will usually need several months to recover from this procedure and fuse with the implant to create a stable foundation for the restoration. If it is successful, we can then attach an abutment and the final restoration. While this option requires a longer recovery period, it offers greater stability, as well. If you are missing one or more tooth, you’re not alone. An estimated 178 million Americans are missing one or more teeth. Dental bridges restore oral function and improve the appearance of your smile. To learn more about the benefits of dental bridges or to schedule your consultation, please contact us online or call (928) 774-2500.